After pulling out the tab, file the sharp edges. The holes can also be enlarged by filing them. The holes should be able to accommodate straps 13-15mm wide. Then hammer the tab flat. The crimped edges should be flattened as much as possible. Finally, file or sand the flattened tab to further to remove any burrs. Insert a short bolt (1/4” for standard tripod bushing) and use a suitable nut on the other side to fix the bolt into the tab. Glue a washer to the bolt to protect the camera base/tripod socket when the strap is attached. 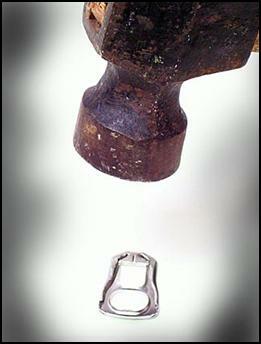 Gluing the nut into the bolt may help. Use cyanoacrylate or epoxy glue for this. Thread a woven strap (available from tailoring suppliers) into the other end of the tab. Loop enough material to make a strap 30 to 50 cm long. The ends of the strap should be sewn together and crimped in place with a piece of metal. A short strap is for wrist use, and a longer one can enable shoulder toting. 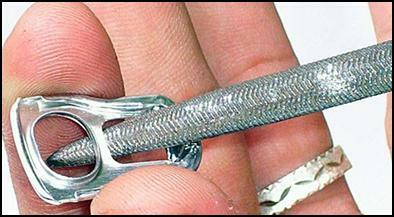 The aluminium tabs can also be used as STRAP BUCKLES. 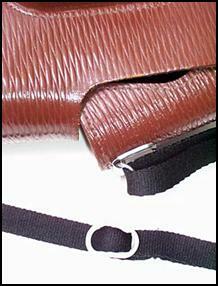 The tabs are prepped in the same way as above, but this time, they are used as adjusting buckles for straps. Shown in the picture is one such example. 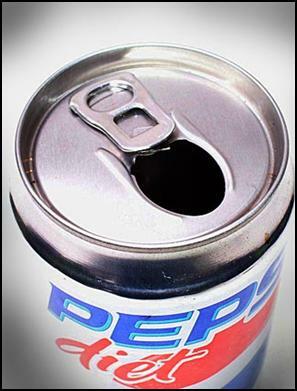 The buckle looks real, but it was originally on a Coke can. 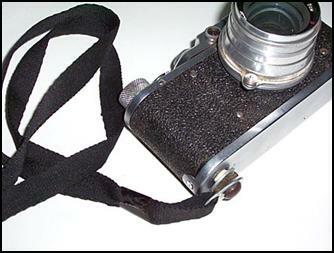 The black cloth strap replaced the original leather strap in a Zenit case which had broken off. 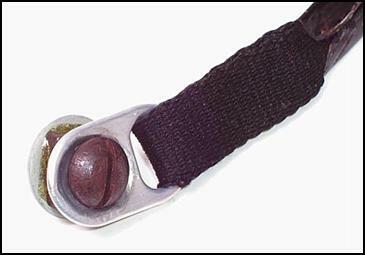 Similar straps could be used in Zorki or FED cases whose leather straps have likely become brittle and unsecured after about 60 to 50 years. This could cause the camera, in its case, to fall at the least opportune moment. The original straps are often found riveted to the cases. A trip to the cobbler could have it possible to have strap eyelets attached to the sides of the case to allow a new cloth strap to be inserted.